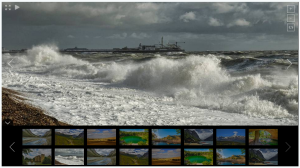 The grid gallery Web Part renders a pictures slideshow with grid of thumbnails. This web part implements unitegallery.js (a popular jquery script) as a client side web part for SharePoint. This web part uses also the Custom Fields library to enhance the web part edition experience. This web part is able to query a SharePoint Picture Library to find the images and render it as a carousel.